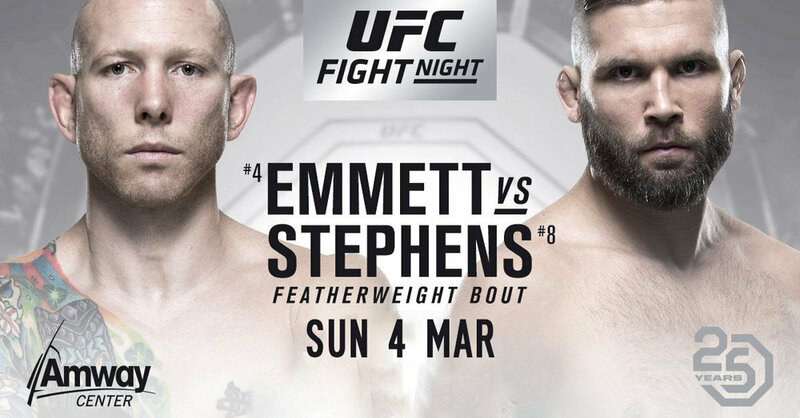 Jeremy Stephens is getting a quick turnaround, facing Josh Emmett in the new main event of UFC on Fox 28. This is the card originally headlined by Romero vs. Branch; Romero, of course, is now headlining UFC 221 against Luke Rockhold. The updated card also features the rebooked Ilir Latifi vs. Ovince St. Preux, as well as Mike Perry vs. Max Griffin, Tecia Torres vs. Jessica Andrade, and Alan Jouban vs. Ben Saunders. 8th-ranked Jeremy Stephens’ win over Doo Ho Choi has given him momentum at 145, despite being only his second win in a row. Josh Emmett is in a similar scenario, this spectacular knockout over top five opponent Ricardo Lamas having earned him a top spot in the rankings out of nowhere. Both fighters will look to solidify their status as top featherweights on the Orlando card, slated for February 25th.